When people ask what whole 30 is, and then I tell them basically what I can't eat they look at me, eyes wide and say "what CAN you eat?" I've learned to just laugh it off. To the outside looking in, it does seem like you are greatly restricted. Yet, I never tired of anything I ate the entire month (excluding eggs, which is why I started making monkey breakfast rather early in my whole 30 journey). And like I said in my previous post, I really did have time to cook. My crock pot came in REALLY handy, and I made sure that I made enough to have leftovers so I didn't feel like I was cooking EVERY. SINGLE. MEAL. A little bit of preparation goes a LONG way when you're doing the whole 30, so be sure that you know that going into it if you are thinking about trying it. Also, I know that there are a lot of people on the internets that make big, fancy paleo type meals on these diets and embrace all sorts of new things. I didn't have the energy to try that this go-round, so these are things that were family friendly, that made my life easier and that were all something that I will continue to cook even when I'm not under such a strict regimen. 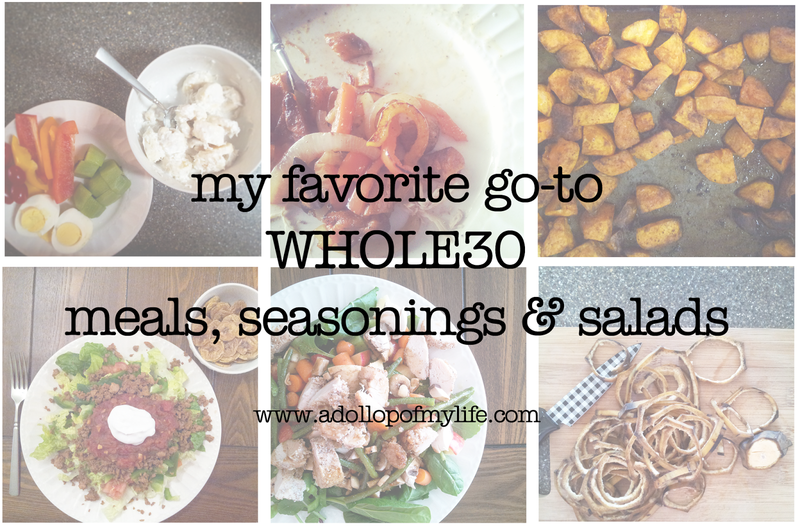 Hope these ideas help any of you who are thinking about doing the whole 30! (I cannot, for the life of me, find the link to this recipe, so I'm going to type out how I made it. If I find it, I will hyperlink to the recipe where I found it). satee onion in olive oil. Add the remaining ingredients, bring to a boil, reduce heat and let simmer for 2 hours, covered. Once it was cooked and cooled, I put in large ziplock bags and laid them flat in the freezer to freeze. This is possibly the best marinara sauce I have ever tasted. SO SO good. And you can't mess it up, because the first batch I made I accidentally put in 4 Tablespoons of oregano and I still could have drank it straight from the stockpot. Ha! salt, pepper, cumin, garlic powder and onion powder all to taste. Mix all ingredients together and store in fridge until ready to eat (tastes better if you allow the seasoning to set in for a few hours before eating). This stays good for about 3 days, and was good wrapped in romain lettuce. Kind of same as above, except I would roughly chop jalapeno and cilantro and put in the pan with the chicken. Gave it a little kick, and worked REALLY well with chicken breasts. The leftovers were GREAT on salads the rest of the week. If I made a whole chicken in the crockpot, I would save the bones and then make bone broth. Basically remove all of the meat from the bones, and then throw the bones in a large stock pot, filling the pot till it generously covers the bones. Throw in your favorite seasonings (I usually used a blend of Italian seasonings, pepper, salt, and if I had it, fresh parsley, carrots and celery) and then let the ingredients boil in the water for several hours (this is great to do right after dinner and then let it boil all night before you go to bed, checking it periodically to make sure the water hasn't gotten too low). After it's finished boiling, simply strain the liquid from all of the solids, and freeze in ziploc bags laying flat in the freezer (this helps it thaw out faster, and also allows you to go back and set the bags upright, freeing up more freezer space). To get the most use out of the broth, I would use the broth to cook chicken (ie: chicken thighs in the crockpot), then when that was done, I would transfer the now VERY stout broth into a stockpot, shred some zucchini noodles and chop up some veggies and use the leftover chicken thigh meat to make chicken "noodle" soup. Throw a couple of chicken breasts (I usually use about 3), some taco seasoning and a jar of compliant salsa (I found that the Wild Oats organic brand found at Walmart was compliant and IT WAS GOOD!) and make as a mexican salad. The boys ate this mixture on tortillas with cheese, so it made an easy meal that we could all eat without me having to have a lot of extra steps.